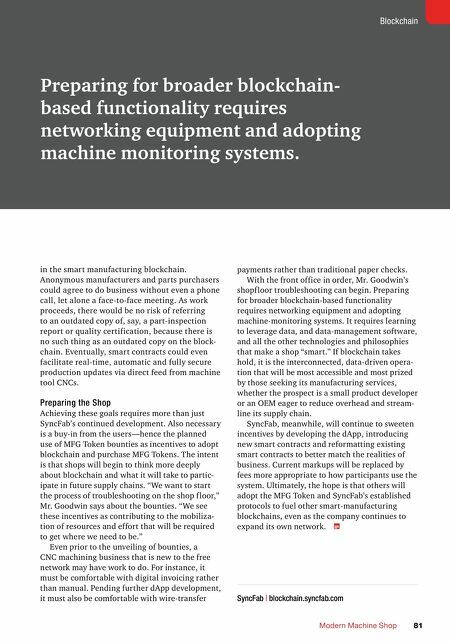 MMS OCTOBER 2018 80 mmsonline.com DATA-DRIVEN MANUFACTURING Goodwin says. After all, revenue from the sale of MFG Tokens is a major source of funding for the network's continued development. Meanwhile, the bounties will serve as a relatively risk-free means of demonstrating the difference between an instant, automated blockchain transaction and one that involves banks, accountants and multiple verification steps. The example is expected to be particularly poignant for smaller machine shops, which can face cash-f low prob- lems due to lengthy payment terms (30, 60 and even 90 days are common). Of course, block- chain is about more than just efficient transactions. As users participate in this system, they will become more familiar with its potential for data security, and for tracking production, shipping and more. The greater their familiarity, the thinking goes, the more eager and willing they will be to embrace the technology's full promise for serving as what Mr. Goodwin calls "a bridge to the Industrial Internet." Automating Supply Chain Transactions Not all blockchains can be a bridge because not all blockchains are created equal. Capability to store and exchange more than just records of monetary transactions is a primary reason why SyncFab chose to set up on the Ethereum plat- form, and to base the MFG Token on the currency of that network, Ether (specifically, on the ERC20 Token Standard). On Ethereum blockchains, cryptocurrency is more than just digital money. Ether-based utility tokens like the MFG Token are the "fuel" for blockchain-based automation called smart contracts. Smart contracts are essentially simple computer programs that use blockchain- embedded data to determine whether certain conditions have been met before performing a specific, automatic function. For instance, a smart contract might transfer a certain number of tokens to another virtual wallet as a payment once an inspection report is approved. MFG Tokens are the "fuel" in that they pay for creating and updating smart contracts, the processing power required to execute them, and, via SyncFab's transaction fees and token sale revenue, further development of the platform. The latter point is particularly critical because smart contracts are not designed to work in isolation. As depicted in the image above, they are the building blocks of more complex, decen- tralized applications (dApps) that automate complex tasks. 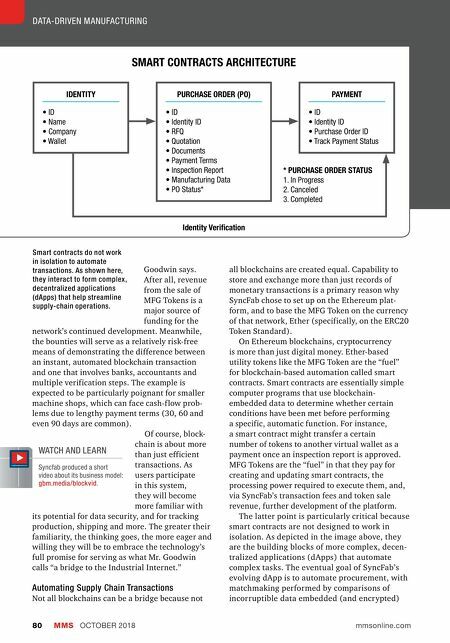 The eventual goal of SyncFab's evolving dApp is to automate procurement, with matchmaking performed by comparisons of incorruptible data embedded (and encrypted) IDENTITY • ID • Name • Company • Wallet PURCHASE ORDER (PO) • ID • Identity ID • RFQ • Quotation • Documents • Payment Terms • Inspection Report • Manufacturing Data • PO Status* * PURCHASE ORDER STATUS 1. In Progress 2. Canceled 3. Completed PAYMENT • ID • Identity ID • Purchase Order ID • Track Payment Status SMART CONTRACTS ARCHITECTURE Identity Verification Smart contracts do not work in isolation to automate transactions. As shown here, they interact to form complex, decentralized applications (dApps) that help streamline supply-chain operations. WATCH AND LEARN Syncfab produced a short video about its business model: gbm.media/blockvid.